A broad spectrum, multipurpose hospital disinfectant cleaner formulated to meet demands for high performing infection control. Kills: Influenza A. HIV, HEPATITIS A, B and C, Mycobacterium TB, MRSA, VRE, Canine Parvovirus, Poliovirus,and SARS. Ready to use. No dilution, no activator - No mistakes to obtain correct dilution levels. Safe to use. Non-corrosive, non-staining, non-toxic, non-irritating, pleasant fragrance. Environmentally friendly. 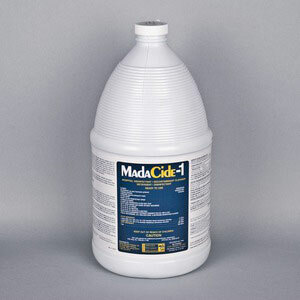 Unlike Glutaraldehydes and many others, MadaCide-1 offers easy disposal - just pour down the drain. Stable. No alcohol content makes MadaCide-1 non-flammable, non-combustible and non-volatile.